The season for whitewater rafting or a relaxing river cruise may still be a month or more off in much of the West, but not in south central Idaho. 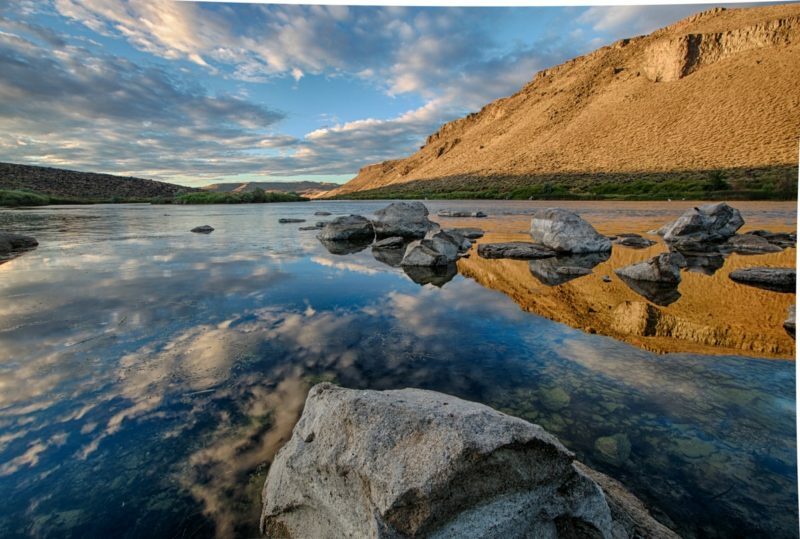 Warm temperatures and good water levels make April the start of the season for two easy trips on the Snake River. Tucked in a bend of the Snake just 32 miles northwest of Twin Falls, Hagerman is the start for two types of river trips. Downriver, a 10-mile stretch of water delivers a four- to five-hour run that’s a great introduction to whitewater rafting. “People are surprised by it,” says Olin Gardner, whose Idaho Guide Service offers early-season trips here. “We’ve got so many rivers in Idaho that it’s just not as appreciated as it should be.” Most of the water is lazy, with glimpses of deer and blue herons, but a half-dozen class 2 and 3 rapids add excitement. For a more mellow ride, motor upstream on a pontoon boat operated by 1000 Springs Tours. Riley Creek Falls and smaller springs cascade over dark canyon walls, providing drama on this two-hour cruise. Tiny Hagerman does offer a few diversions for confirmed landlubbers. At the Hagerman Fossil Beds NationalMonument visitor center (open Thu-Sun; 221 N. State St.;208/837-4793), get a feel for the city’s prehistoric denizens from fossils found during several digs sponsored by the SmithsonianInstitution and the National Park Service (the monument itself is across the river). Shops like Prism Stained Glass (open Tue-Fri; 220 S. State; 208/837-6097) and Snake River Pottery (555E River Rd. ; 208/837-6527) anchor a growing local art scene. The Snake River Grill (corner of State and Hagerman Streets; 208/837-6227) is the area’s best restaurant. Chef and owner Kirt Martin serves a hearty breakfast and features fresh local trout and sturgeon at lunch and dinner ― a satisfying end to a day on the river. WHERE: From I-84 coming from Boise, take the Bliss exit (U.S. 30); coming from Twin Falls, take the second Wendell exit. CONTACT: Idaho Guide Service, $60 including lunch; www.idahoguideservice.com 1000 Springs Tours, $24 cruise only, $40 brunch/dinner cruise; www.northrim.net/tst or (208) 837-9006. or (888) 734-3246.